ROAD TOWN, BRITISH VIRGIN ISLANDS--(Marketwired - December 13, 2016) - Talon Metals Corp. ("Talon" or the "Company") (TSX: TLO) is pleased to provide an update on the Tamarack Nickel-Copper-PGE project ("Tamarack Project"), located in Minnesota, USA. The Tamarack Project comprises the Tamarack North Project and the Tamarack South Project. Talon owns an 18.45% interest in the Tamarack Project. Positive drill results from the summer drilling program have been received from three exploration targets and from the Tamarack Zone. The CGO Bend: 750 meter, up-dip of the Tamarack Zone where drill hole 16TK0238 intercepted 2.2 meters of mixed massive sulphide ("MMS") mineralization grading 1.75% nickel ("Ni"), 0.89% copper ("Cu"), 0.32 g/t PGE AND 0.12 g/t gold ("Au") from a depth of 117.72 meters confirming continuity of a shallow mineralized trend and a new target with positive implications for the further development of Tamarack. The 221 Zone: 1.8 km north of the Tamarack Zone where drill hole 16TK0239 intersected 2.26 meters of massive and mixed massive sulphides grading 1.28% Ni, 0.80% Cu, 0.31 g/t PGE's and 0.08 g/t Au from a depth of 566.25 meters. 15TK0218C with 0.5 meters at 3.70% Ni, 1.51% Cu, 1.12g/t PGE's, 0.11g/t Au from a depth of 1121.25 meters. 16TK0236 with 1.1 meters at 2.55% Ni, 4.32% Cu, 3.59 g/t PGE's, 0.82g/t Au from a depth of 1044.45 meters. In the Tamarack Zone further results have been received following on from those reported in the press release dated November 22, 2016. These include two Massive Sulphide Unit ("MSU") intersections where drill hole 16TK0244 intercepted 2.03 meters of MSU at the edge of the western MSU grading 9.6% Ni, 4.04% Cu, 1.83 g/t PGE's, 0.45 g/t Au from a depth of 448.81 meters; and drill hole 16TK0247 which intersected the northeastern MSU extension, with 5 meters grading 3.26% Ni, 2.59% Cu, 0.46g/t PGE's and 0.28g/t Au from a depth of 398 meters, which included two discrete higher grade zones. Drill hole 16TK0250 intersected the southern part of the 138 Zone with 91 meters of disseminated mineralisation grading 0.62% Ni, 0.42% Cu, 0.25g/t PGE's and 0.10g/t Au from a depth of 420.5 meters, which also included a number of higher grade zones, showing that mineralization is still open to the south of the 138-Zone. Drill hole 16TK0251, located along the north western edge of the modeled SMSU intercepted three zones of interstitial to blebby sulphides (see Table 2 for intercept lengths and grades). "The Tamarack Project ends 2016 with a series of high grade Ni-Cu sulphide mineralization intercepts, not only in the Tamarack Zone but also in distal areas along the Tamarack Intrusive Complex ("TIC"), as far as 1.8 kilometers to the north and 3.5 kilometers to the south of the Tamarack Zone. During 2016, Kennecott Exploration Company safely achieved a drilling success ratio of 93%, with 28/30 drill holes intercepting massive, mixed massive and/or disseminated Ni-Cu sulphide mineralization," said Henri van Rooyen, CEO of Talon. "We look forward to continuing our partnership of asset value creation with Kennecott Exploration Company and wish to thank our shareholders for their support during this exciting year at the Tamarack Project." Drill hole 16TK0238 intercepted 2.2 meters of MMS mineralization grading 1.75% Ni, 0.89% Cu, 0.32 g/t PGE AND 0.12 g/t Au from a depth 117.72 meters at the base of the FGO Intrusion. The drill hole was part of the summer drilling program targeting a gravity anomaly in the CGO Bend target area located 750 meters north of the Tamarack Zone (see Figure 1). The gravity anomaly has now been interpreted to be associated with part of the CGO intrusion which was intersected at depth below sediments underlying the FGO (see plan in Figure 1). Figure 1: Plan and Long section looking west showing the CGO Bend up-dip of the Tamarack Zone, where drill hole 16TK0238 is located, and the 221 Zone with drill hole 16TK0239. 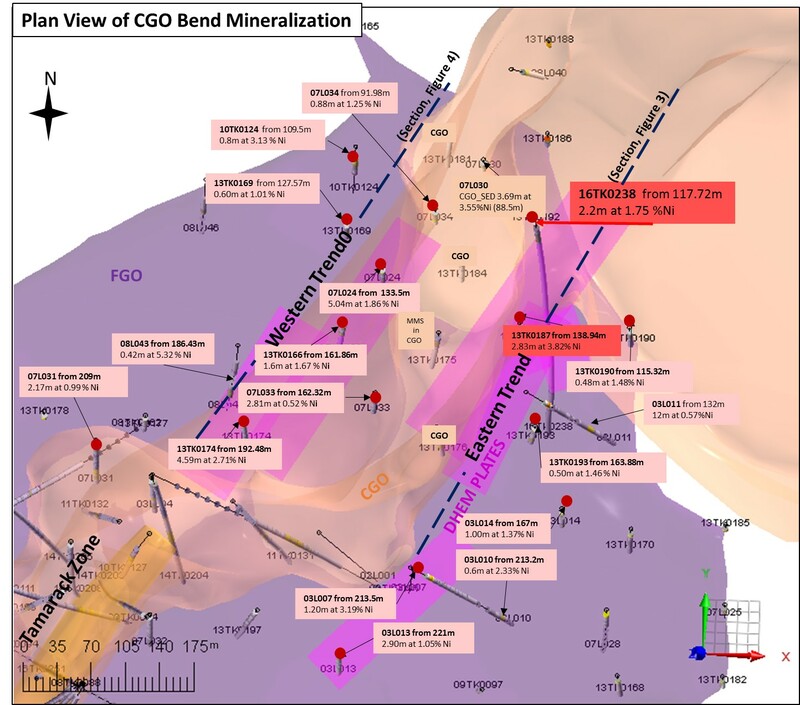 The Plan shows the Bouguer gravity anomaly that trends north-northeast through the CGO Bend to the 221 Zone, and is interpreted to represent the underlying CGO intrusion, and also shows the trend (idealized) of 221 target mineralization. The new intercept of shallow mineralization is very positive as it demonstrates potential continuity of mineralization at the base of the FGO intrusion with mineralization previously intersected in historic holes (pre-2014) along a north-northeast trend both to the west and east of the CGO intrusion (see Figure 2, 3, 4), up-dip from the Tamarack Zone. 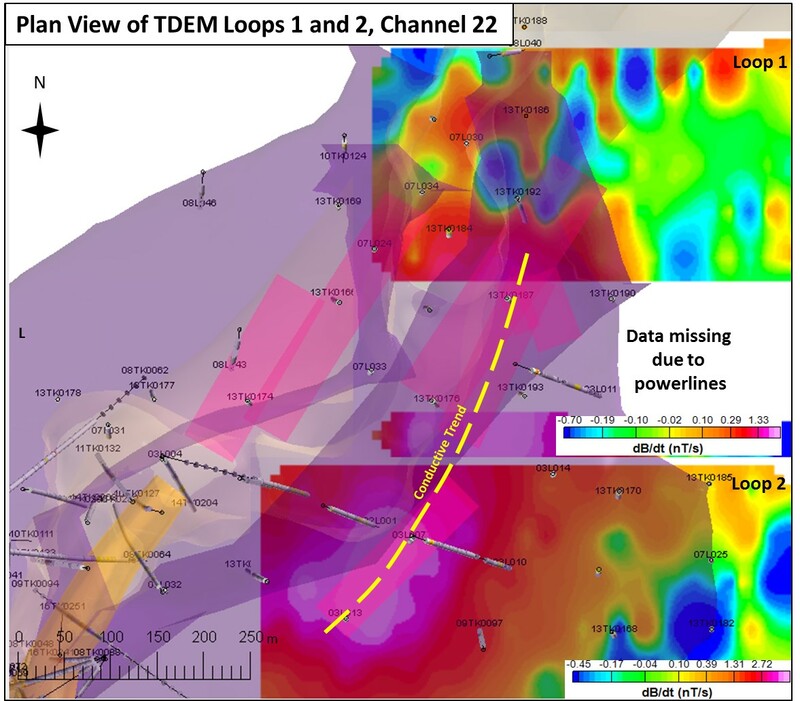 The potential for the mineralisation is also supported by prominent drill-hole electromagnetic ("DHEM") conductors (see Figure 2) and a recent low-frequency time domain electromagnetic survey ("TDEM") over the eastern trend (see Figure 5). 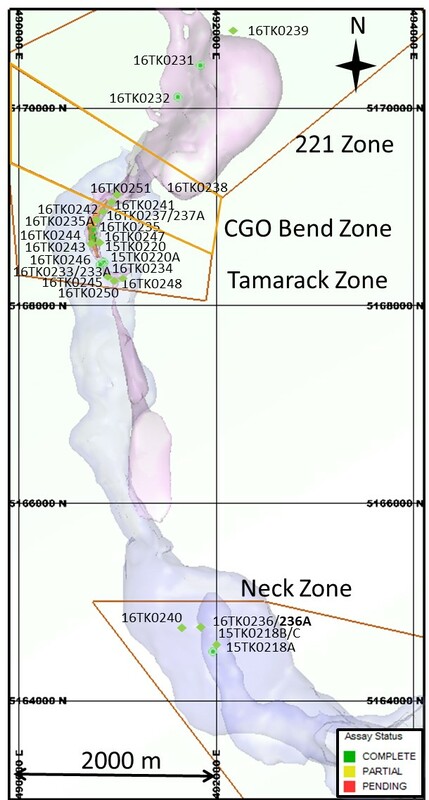 Figure 2: Plan view showing the CGO Bend up-dip of the Tamarack Zone with locality of drill hole 16TK0238 towards the north of the eastern trend of the CGO bend. 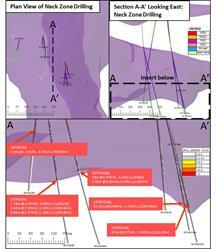 Also shown are other historical drill hole intercepts and interpreted DHEM conductors which support the potential for continuity of mineralisation at the base of the FGO both to the east and west of the CGO (see sections in Figure 3 and 4 and Table 3 for table of historical intercepts). In drill hole 16TK0238 the mineralization trend was confirmed from the DHEM survey that indicated an off-hole conductor trending north-northwest that was coincident with 2.83 meters (from 138.94m) of similar MMS mineralization previously intersected at the base of the FGO in drill hole 13TK0187, which graded 3.82% Ni and 1.62% Cu, 0.63 g/t PGE and 0.36 g/t Au from a depth of 138.94 meters (see Figure 2 and 3 and Table 3). Figure 3: Long section (looking west) of the eastern trend of the CGO Bend with the localities highlighted of 16TK0238 and 13TK0187. The section also shows other significant mineralised intercepts at the base of the FGO from the eastern CGO Trend and the interpreted DHEM conductors that are coincident with the mineralisation at the base of the FGO. 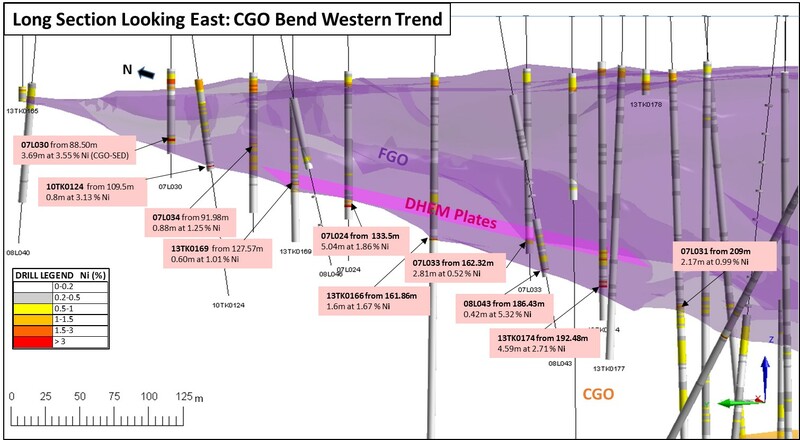 Figure 4: Long section (looking east) of the western trend of the CGO Bend with the localities of significant mineralised intercepts from this trend at the base of the FGO and the interpreted DHEM conductors that are coincident with the mineralisation at the base of the FGO. 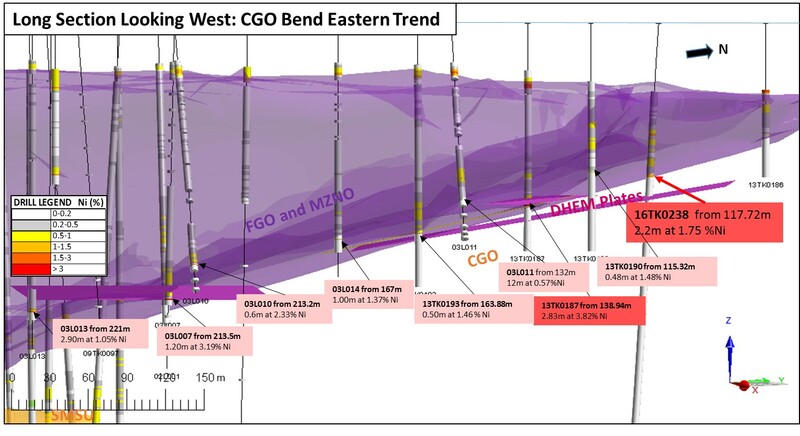 The potential continuity of mineralization along the eastern trend has also been supported by a recently completed TDEM survey covering the western trend of the CGO bend that has shown a conductor at the depth of the base of FGO that also corresponds with the interpreted DHEM conductors. Figure 5: Plan of the CGO Bend with the recently completed TDEM survey covering the eastern trend, with conductors corresponding the interpreted DHEM conductors at the base of the FGO. The mineralization highlighted in the CGO bend occurs at shallow depths at the base of the FGO ranging from approximately 100 meters to 250 meters depth and occurs to the east and west of the CGO over a potential strike of approximately 500 meters with indications from the distribution of drill holes that it may be relatively widespread. An additional mineralized target in the CGO Bend indicated by historical intersections is the Semi Massive Sulphide Unit ("SMSU") mineralization associated with the CGO intrusion indicating that the SMSU may also be developed up-dip from the Tamarack Zone into the CGO bend (eg. 13TK0175 with 11.84 meters of 1.02% Ni from 114.66 meters depth). Both the shallow nature of the CGO bend mineralization and its up-dip connection to the Tamarack Zone make the CGO Bend an important and potentially strategic target for the future development of the Tamarack Project. The 221 Zone is located 1.8 km north of the Tamarack Zone on the coincident magnetic and gravity anomaly associated with the CGO intrusion that extends north from the CGO Bend (see Figure 1). Drill hole 16TK0239 is located 250 meters north of previous drilling in the 221 Zone (see Talon press releases May 28, 2015, September 1, 2015 and June 2, 2016) and intersected a mineralized mafic intrusion between the CGO and meta-sediments, and from a depth of 566.25 meters intersected 2.26 meters of massive and mixed massive sulphides grading 1.28% Ni, 0.80% Cu, 0.31 g/t PGE's and 0.08 g/t Au (Figure 6). 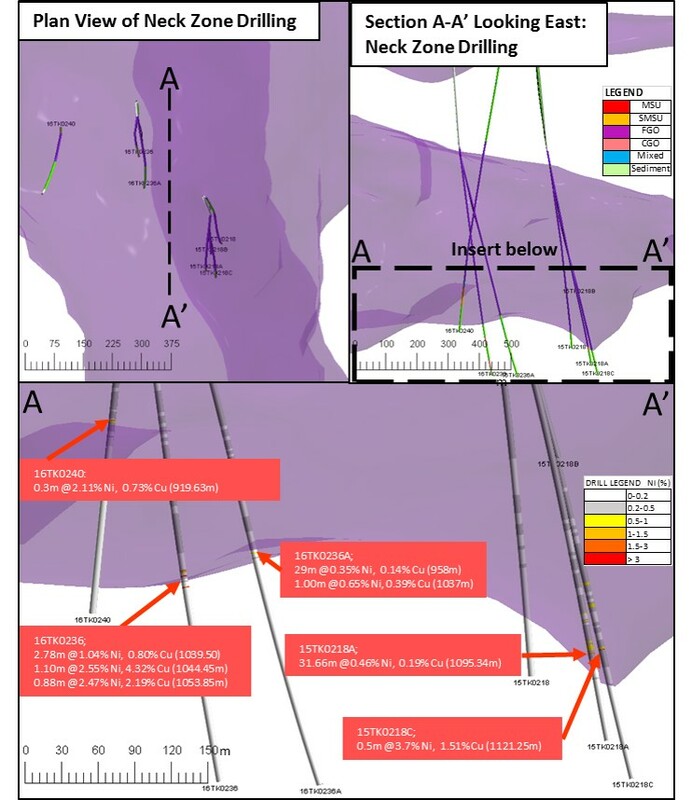 The mineralized sequence is significant as it occurs at a shallower depth but on the same trend, and is interpreted to be similar to the mineralization intersected in drill hole 15TK0229 where 2.84 meters of disseminated and massive sulphide mineralization from 700.83 metres depth graded 7.68% Ni, 4.59% Cu, 2.41 g/t PGE's and 0.53 g/t Au (see Talon press release September 1, 2015). Figure 6: Plan and long section showing the 221 Zone and drill hole 16TK0239 located 250 meters to the north-northeast. Mineralization occurs within a mafic intrusion between the CGO and meta-sediments and drill hole 16TK0239 suggests it may shallow towards the north. The drill results from four new drill holes have confirmed the "Neck" as an exciting exploration target. The "Neck" which is located 3.5 km south of the Tamarack Zone is associated with a prominent gravity anomaly that has conceptually been interpreted as a possible entry point to the larger "Bowl" or lopolithic intrusion to the south, with potential implications for settling and accumulation of massive sulphide mineralisation on a large scale. Figure 7: Locality of the Neck Exploration Target 3.5 km south of the Tamarack Zone. New results that have been received for drill holes include those from: 15TK0218B and 16TK0218C (deflections from 15TK0218 and 15TK0218A, see Talon press release 29 July 2015, 24 February 2016 and 2 June 2016), 16TK0236, 16TK0236A and 16TK0240. The FGO has been shown to plunge to the south potentially underlying the bowl as a possible feeder, supporting the conceptual model. The FGO shows the same geochemical trends and magmatic layering observed in the Tamarack Zone demonstrating the large regional scale of the FGO intrusion as a mineralised system. The persistent development of the potentially fertile basal layer of the FGO that is typically associated with the keel where sulphides may accumulate has been demonstrated in most of the drill holes. Importantly, in most holes there is the widespread presence of disseminated sulphides within this basal layer and in the immediately underlying sediments. The accumulated sulphides at the base of the FGO appear to show a progressive increase in thickness towards the west and north, and although they generally represent low grades where they have been drilled, they may potentially represent a vector to high grade mineralisation. Drill hole 15TK0218C (15TK0218B was abandoned before the base of FGO was reached) was drilled as a deflection from 15TK0218A to target a proximal off-hole anomaly coincident with the base of the FGO that was defined by the DHEM surveys from drill holes 15TK0218 and 15TK0218A (see Talon press releases July 29, 2015, February 24, 2016, June 2, 2016). 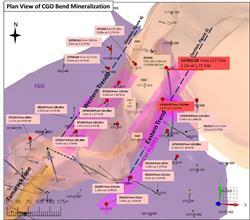 Drill hole 15TK0218C intersected over 150 meters of disseminated sulphides towards the base of the FGO. An intersection of 0.5 meters MMS grading 3.70% Ni, 1.51% Cu, 1.12g/t PGE and 0.11g/t Au was intersected from 1121.25 meters depth towards the base of the FGO. Drill hole 16TK0236A was a deflection from 16TK0236, planned as a 72 meter step-out to the south targeting a DHEM conductor interpreted from the mother hole. The drill hole intersected a 29 meter anomalous zone grading 0.35% Ni and 0.14% Cu toward the base of the FGO with a single 1 meter zone grading 0.65% Ni and 0.39% Cu occurring in the meta-sediments below the FGO. Although no CGO-type intrusion was intersected in 16TK0236A, a number of mafic dykes were intercepted below the FGO. Drill hole 16TK0240 was an approximate 200 meter step out to the west of 16TK0236, targeting features in the gravity anomaly. The drill hole intersected 46 meters of greater than 1% sulphides towards the base of the FGO and a 0.3 meter MMS in a mafic intrusion at the base of the FGO grading 2.11% Ni, 0.73% Cu, 0.13 g/t PGE and 0.03 g/t Au. Figure 8: Plan and sections looking west summarising drill hole results in the Neck. Results from an additional four drill holes (16TK0244, 16TK0247, 16TK0250 and 16TK0251) have been received that were part of the summer drilling program designed to expand the mineralization in the Tamarack Zone which hosts the resource prepared in accordance with National Instrument 43-101. These results follow on from the successful results reported in the Talon press release dated November 22, 2016 that demonstrated the potential extension of the high-grade MSU to the northeast and to the southwest. Those results also demonstrated the potential extensions of the 138 Zone mineralisation to the southwest and southeast with additional intersections supporting the continuity of the SMSU mineralisation. Drill hole 16TK0244 which intercepted the western MSU grading 2.03 meters at 9.6% Ni, 4.04% Cu, 1.83 g/t PGE's, 0.45 g/t Au from a depth of 448.81 meters. Drill hole 16TK0250 was drilled in the southern part of the 138 Zone and intercepted 91 meter thickness of disseminated mineralisation from 420.5 meters within the MZNO Intrusion grading 0.62% Ni, 0.42% Cu, 0.25g/t PGE's and 0.10g/t Au, which also included a number of higher grade zones, that included. Figure 9: Plan and section looking east summarising drill hole results in the Tamarack Zone. The summer drilling program has been very successful in indicating the potential for extensions in the Tamarack Zone, which hosts the Tamarack Project resource prepared in accordance with National Instrument 43-101. Indeed, the Tamarack Zone has proven the concept introduced by Dr. A.J. Naldrett in his seminal paper: World-class Ni-Cu-PGE deposits: key factors in their genesis (1999), where he stated: "When most major Ni-Cu sulphide deposits are compared, they prove to have a number of features in common: olivine-rich magma, proximity of a major crustal fault, sulfide bearing country rocks, field and/or geochemical evidence of interaction between the magma and the country rocks and the presence of or proximity of a magma conduit". Dr. Naldrett could have been describing the approximately 18 kilometer TIC, where drilling at the high grade Tamarack Zone started in 2008. Intensive drilling in the Tamarack Zone to extend the northern part of the MSU especially the north-eastern flank of the Tamarack Zone (drill holes 16TK0235, 16TK0235A, 16TK0237, 16TK0237A, 16TK0243, 16TK0247 and 16TK0244). In the southern portion of the Tamarack Zone to extend the MSU to the south to below the 138 Zone (drill holes 16TK0234, 16TK0233A and 16TK0246). In the northern portion of the Tamarack Zone to provide in-fill drilling and to test the limits to the SMSU (drill holes 16TK0220, 16TK0220A, 16TK0235, 16TK0235A, 16TK0237, 16TK0237A, 16TK0241, 16TK0242, 16TK0243 and 16TK0244). In the 138 Zone to test the limits of the MZNO mineralization (drill holes 16TK0234, 16TK0245, 16TK0248 and 16TK0250). Continue to look for massive sulphide mineralization north-east of the Tamarack Zone in the CGO Bend and the 221 Zone by following a gravity-high striking north north-east for approximately 1.5 kilometers (drill holes 16TK0238 and16TK0239). Figure 10: Localities of drill holes for the summer and winter exploration programmes. The localities and status of assay results are also shown. This news release contains certain "forward-looking statements". All statements, other than statements of historical fact that address activities, events or developments that the Company believes, expects or anticipates will or may occur in the future are forward-looking statements. These forward-looking statements reflect the current expectations or beliefs of the Company based on information currently available to the Company. Such forward-looking statements include, among other things, statements relating to the potential continuity of mineralisation and the positive implications of such continuity for the further development of Tamarack, including the potential continuity of mineralization at the base of the FGO intrusion; the potential extension of the high-grade MSU to the northeast and to the southwest and the potential extensions of the 138 Zone mineralisation to the southwest and southeast with additional intersections supporting the continuity of the SMSU mineralisation; the potential for extensions in the Tamarack Zone; the fact that the shallow nature of the CGO bend mineralization and its up-dip connection to the Tamarack Zone make the CGO Bend an important and potentially strategic target for the future development of the Tamarack Project; the fact that the "Neck" has conceptually been interpreted as a possible entry point to the larger "Bowl" or lopolithic intrusion to the south with potential implications for settling and accumulation of massive sulphide mineralisation on a large scale; and the form and extent of mineralization, targets, goals, objectives and plans. Forward-looking statements are subject to significant risks and uncertainties and other factors that could cause the actual results to differ materially from those discussed in the forward-looking statements, and even if such actual results are realized or substantially realized, there can be no assurance that they will have the expected consequences to, or effects on the Company. Factors that could cause actual results or events to differ materially from current expectations include, but are not limited to: failure to establish estimated mineral resources, the grade, quality and recovery of mineral resources varying from estimates, the uncertainties involved in interpreting DHEM surveys, drilling results and other geological data, inaccurate geological and metallurgical assumptions (including with respect to the size, grade and recoverability of mineral reserves and resources, uncertainties relating to the financing needed to further explore and develop the properties or to put a mine into production and other factors (including exploration, development and operating risks)). Collar coordinates are UTM Zone 15N, NAD83. Azimuth and Dip are downhole survey averages for the hole. For daughter holes; collar coordinates and elevations are same as mother hole; approximate wedge depth given; azimuth and dip are the survey averages below the wedge. *Preliminary, awaiting final survey results. Highlighted results are those holes reported in this Press Release. Pending: Assays have not been received by release date. Length: refers to borehole length and not True Width. True Width is unknown at the time of Publication. All samples were analysed by ALS Minerals. Nickel, copper, and cobalt grades were first analysed by a 4 acid digestion and ICP AES (ME-MS61). Grades reporting greater than 0.25% Ni and/or 0.1% Cu, using ME-MS61, trigger a sodium peroxide fusion with ICP-AES finish (ICP81). Platinum, palladium and gold are initially analyzed by a 50g fire assay with an ICP-MS finish (PGM-MS24). Any samples reporting >1g/t Pt or Pd trigger an over-limit analysis by ICP-AES finish (PGM-ICP27) and any samples reporting >1g/t Au trigger an over-limit analysis by AAS (Au-AA26). Azimuths and dips are taken from survey record at collar unless otherwise noted. * No record of collar azimuth and dip. First record of downhole survey used. "Historical results" are from selected pre 2014 holes not previously reported and were analyzed by ALS. Results included in table are those quoted in text and on figures in this Press Release. The assay methodologies for the more recent holes are as quoted for Table 2, however different methods and standards may have been used for older assays. Results included are for the higher grade mineralization at the base of the FGO or MZNO or in immediately underlying sediments. Results for Semi Massive Sulphide Mineralisation (SMSU within CGO) are also given for 13TK0175. In 2003 and 2007 base metals were analyzed by ME-ICP81 (a sodium peroxide fusion with AES finish) and Au, Pt, and Pd were analyzed by PGM-ICP23 (a 30g fire assay). In 2008, base metals were analyzed by ME-MS61 with over-limits going to ME-ICP81. All elements reported in the press release have analysis by the fusion method (ME-ICP81). Au, Pt and Pd were by the PGM-ICP23 (30gram fire assay) method. In 2010, Me-MS61 and ME-ICP81 methods were used on all assays reported. Au, Pt and Pd were reported by PGM-ICP24 (50 gram fire assay with an ICP-AES finish). In 2013, Me-MS61 and ME-ICP81 methods were used on all assays reported. The Au, Pt, and Pd method is PGM-MS24 (50 gram fire assay with ICP-MS finish). About this company Talon Metals Corp.